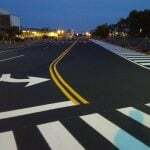 There is a selection process for choosing your pavement material utilized by state departments of transportation for roadway construction to identify and select the best material based on several environment and performance categories. When evaluating these categories, the goal is to select the best pavement material based on the overall value. The AASHTO Guides emphasize just how important soil characteristics play in pavement construction. It states that the nature of the soil in the particular area may determine the economic viability of a pavement material. The working platform must provide a stiff enough surface to allow compaction of the overlaying pavement structure. Soil & Asphalt – Asphalt pavements have been successfully constructed on all different types of soil (from gravel to peat). It also is able to accommodate a certain amount of settling or displacement to the underlying soil without major impact. Moisture and temperatures play a big role in the condition of your pavement surface. 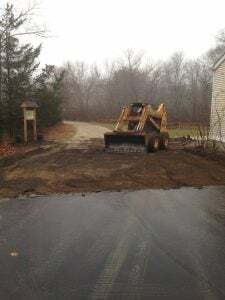 The ability for your pavement material to be able to withstand moisture from rainfall, snow and freezing and thawing is important in your decision making. Also, the ability to withstand snow removal practices as well as its ability to absorb moisture from solar energy. Climate & Asphalt – Asphalt is flexible to be designed for any weather as it provides a variety of effective options to handle various weather conditions. While traffic forecasts can often be inaccurate, a general idea of expected traffic loads and volume can help to determine the best material for your project. 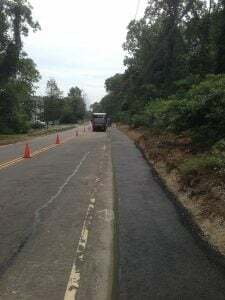 Traffic & Asphalt – asphalt is the most popular pavement material for low and medium traffic roadways and has even proven itself over time in heavy truck load settings. Considering how long a pavement material will last is a huge determining factor in your selection process. Life Cycle & Asphalt – According to a study conducted on asphalt pavements on interstate highways in Oregon and Washington, the average age of asphalt on these tested systems was about the same or greater than that of concrete pavement in similar conditions. Considering how much traffic variations and holdups will occur during the length of your project can be used as a comparison tool. Ease of construction will not only save you headaches but also time and money. Asphalt & Constructibility – Asphalt allows for a number of different construction scenarios and can be built fast. Its cure time is not days to weeks, but instead usually a matter of hours. It can also be complete is phases allowing for off-peak schedules to allow for minimal traffic interruptions. Consider the costs to shut down lanes of traffic for extended periods of time for longer construction. An obvious area of material comparison is cost. However, when evaluating cost, we need to consider initial costs, staging costs, predicted performance life, maintenance costs, and salvage value. Cost & Asphalt – A comparison of asphalt and concrete was conducted on interstate pavements in Ohio and it was determined that asphalt cost less to build initially and also required only small investments in maintenance. Asphalt is generally about 20 percent cheaper than concrete, and maintenance is generally cheaper. While asphalt averages a lifespan of about 15-30 years and concrete is about 30-40, both the initial costs and maintenance costs (and difficulty) of concrete are more expensive. It has become a common practice to use the “greenest” methods for operation as possible. According to AASHTO Guide, the ability to recycle existing and future materials used may help in determining the best pavement material. Sustainability & Asphalt – Asphalt can be recycled back into a new asphalt mix and the binder as well as the aggregate are reused. By reusing the asphalt binder, you can consume less virgin binder, which conserves petroleum and allows for less mining. Milling and full depth reclamation are both environmentally friendly methods of paving that focus heavily on recycling and repurposing. 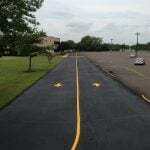 Generally speaking, when considering all of these areas of comparison, asphalt will almost always outweigh concrete in terms of cost, flexibility, sustainability, and performance. See our blog 5 Reasons To Choose Asphalt for more on this. 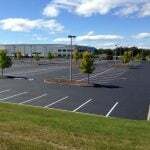 Ready to pave your parking lot and/or are you in need of repairs? 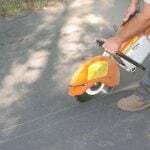 Contact EastCoat Pavement services today for your free consultation!